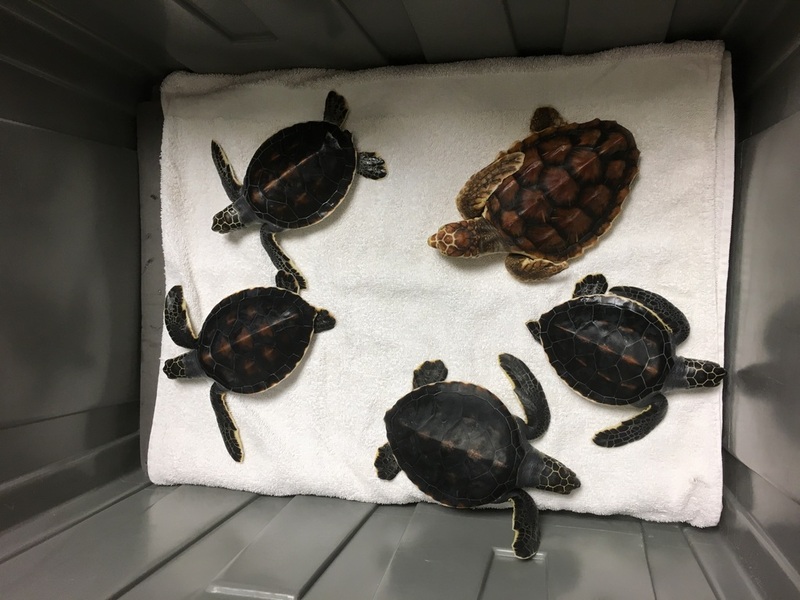 The Florida Aquarium successfully sent five sea turtle hatchlings back to the ocean after an eight-month stay at the downtown Tampa facility. 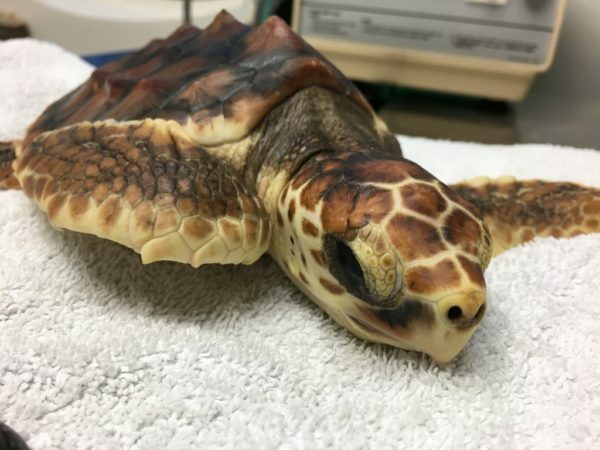 The ‘washback’ sea turtle hatchlings, which were released a couple of miles offshore from the Florida Fish and Wildlife Conservation Commission’s watercraft into the Gulf of Mexico, included four green and one loggerhead. The term washback refers to the action of baby sea turtles being washed back onto the beach after failed attempts to swim past the crashing waves. These baby sea turtles stayed at the Aquarium until a proper seaweed patch was found off local coasts to give them the best chance of survival. 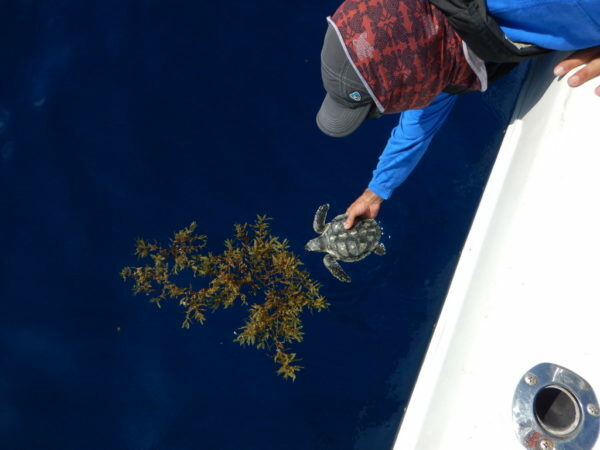 “In ideal conditions, hatchlings make their way past the surf a couple of miles offshore where they find a seaweed patch, and they live up to a couple of years in the weed line that serves as a refuge and supplies food until they’re big enough to head further out to sea,” said The Florida Aquarium’s Associate Veterinarian Dr. Ari Fustukjian. The hatchlings were joined by a juvenile Kemp’s ridley sea turtle which stayed at the Aquarium overnight before being released. All of these sea turtles came to the Aquarium from the Florida Panhandle. The sea turtle hatchlings arrived to the Aquarium on November 9, 2016 for temporary housing after immediate transport from Gulfarium C.A.R.E. Center, provided by Florida Fish and Wildlife Conservation Commission. 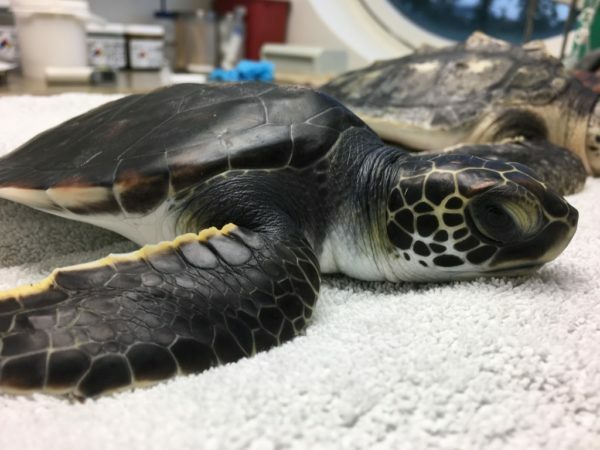 Green and Kemp’s ridley sea turtles are classified as ‘endangered,’ and loggerhead sea turtles are classified as ‘threatened’—nearly endangered. 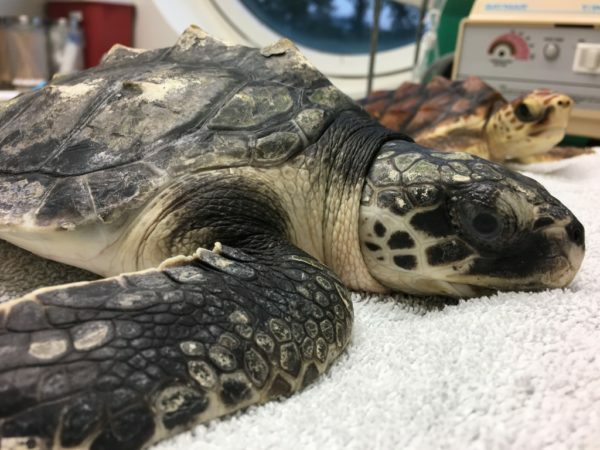 After many months of anticipation and care provided by the Aquarium’s animal health and husbandry team, the turtles grew large and strong enough to successfully swim seaward. 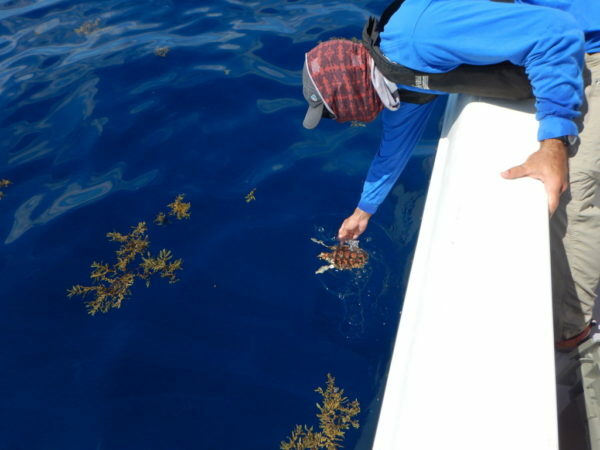 Seaweed, or ‘weed lines,’ provide safety and camouflage for the turtles and also serve as a nursery for these and hundreds of other species of fish and invertebrates–food for the hatchlings. “They’ll travel with these floating nurseries for a few years before getting big enough to start striking out on their own,” Fustukjian added. During their stay at The Florida Aquarium the young turtles were provided with special ultraviolet lighting which is crucial to growth, as well as large quantities and varieties of food. In just six months, the loggerhead turtle hatchling went from just 39 grams in weight to more than 480, and from 3-4” shell length to 7-8”. The other animals experienced the same type of growth. These three species represent three of the seven types of sea turtles found worldwide, and three of the five species that nest regularly each year on Florida’s coasts. Sea turtle nesting season takes place from May through October. Beach goers can help sea turtles by leaving marked nests alone and not interfering with hatchlings that are heading out to sea, which usually takes place at night.